#1: Astonishing diversity within a little land is probably the main reason why every backpacker should fly to Sri Lanka. You get to accumulate assorted travel experiences in a short itinerary and at a lesser travel expenditure. Area-wise Sri Lanka is even smaller than my state, West Bengal, which ranks 14th in size among all Indian states. So, theoretically it'll be more rewarding for me to explore Sri Lanka than rediscovering my state. Crossing the flat coastal land into island's central province, the climate begins to change as the terrain begins its gradual ascent into fog-veiled cliffs covered in vegetation of short trees and lush green tea estates. From the wide plains of the central highlands to rocky bays guarding the island's coastal fringes, to the thrilling dark tropical rain forest of its lowlands and the soothing lakes, exuberant wetlands and moody rivers, Sri Lanka is ever ready to surprise you with her range of offerings! #2: Getting a Sri Lankan tourist visa is no tougher than preparing instant noodles. Applying and obtaining visa is the second trickiest part of every foreign trip (first being the travel expense). Thankfully, Sri Lanka is very tourist friendly in her visa protocols. An intended traveller needs to apply and obtain an electronic travel authorisation (ETA) prior to arrival in Sri Lanka which is issued through an online system. I've already blogged on how an Indian traveller can procure his Sri Lankan tourist visa. If you're a backpacker from Maldives, Seychelles or Singapore, you can visit Sri Lanka anytime and obtain a visa on arrival, free of cost. #3: Sri Lankan food is simply delicious! Oh wait, do not try them randomly if you have an irritable bowel. Sometimes Sri Lankan cuisine can be too hot to handle. 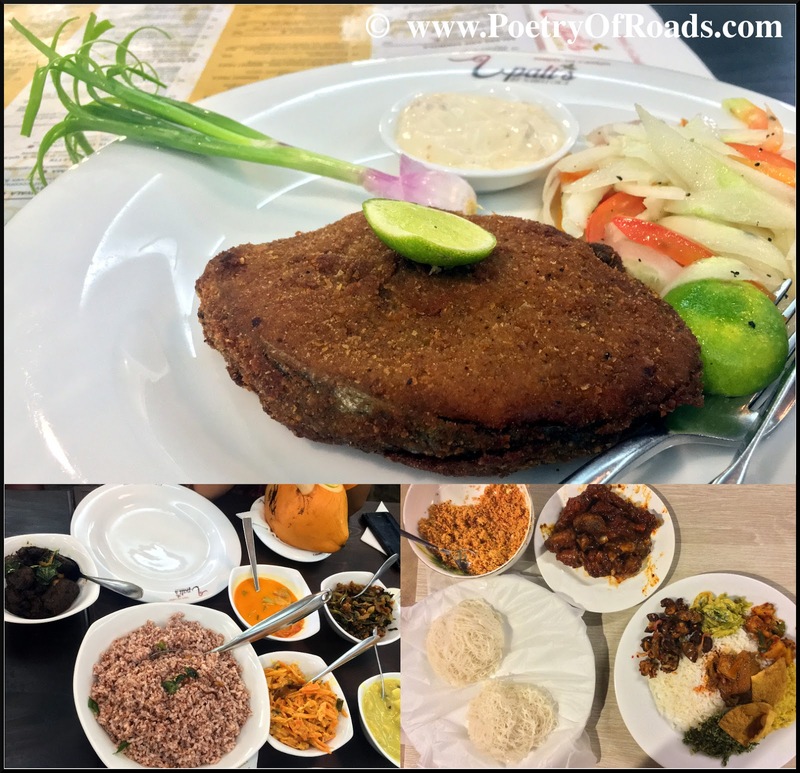 The cultivation of many types of rice, vegetables, spices, fruits, blended with bygone foreign influence, has resulted in a highly distinctive as well as desirable style of cuisine that boldly competes with Indian food. Rice is the staple food of the island which is consumed with yummy curries. Hoppers, string hoppers and pittu are also widely consumed staples in Sri Lanka. I believe majority of the backpackers (ignore my bias) are seafood freaks. Well, you will certainly relish fresh array of fish, crab, prawns and crayfish once you land on Sri Lanka's sunny shores. Do not miss Sri Lankan snacks by any chance. They are less oily and easier to digest when compared to Indian ones. Overall, I found the price of food slightly on the higher side on most of the eateries throughout the island. #4: Backpacking in Sri Lanka is easy and affordable (provided you don't keep comparing your every expense with what you would have spent in India). Whether in Colombo or some other city, I had always paid 10-20 USD for a spacious hotel room. Travellers on a shoestring budget can also find accommodation in Colombo at a much lesser rate. My typical food expense was 4-8 USD/day. Uber rides costed me roughly 1 USD/3 kilometres. Once you get a tourist SIM card in the airport itself, your navigation and transportation gets a lot easier. Sri Lankan people are known for their warmth and hospitality. Ask for any lead and they are ever eager to oblige you. #5: The sheer depth of Sri Lanka's cultural heritage has earned UNESCO World Heritage status for six of her archaeological sites namely- the sacred city of Anuradhapura, the ancient city of Polonnaruwa, the Golden Temple of Dambulla, the ancient city of Sigiriya, the sacred city of Kandy and the old town of Galle. I'm not particularly a history-hunter, but I enjoy documenting monuments. To me, the enormous dome-shaped dagobas of Buddhist temples to the ruins of ancient cities and statues in Anuradhapura (and also Polonnaruwa) are priceless treasures for every modern age traveller. The Royal capital of Kandy, home to the Sacred Temple of the Tooth Relic which houses the divine tooth relic of the Buddha is a living testament to the intricate and distinctive style of Kandyan architecture and art, and is revered as a pillar of Sri Lankan culture. You can get a glimpse into Sri Lanka's colonial heritage by heading down the island's Southern coast to the renowned 17th century built Dutch Fort in Galle, which is regarded as the finest preserved example of colonial architecture in Asia. Best part is, you can discover all of these in a week-long trip! #6: Sincere wildlife conservation in Sri Lanka since ancient times has made it possible today to project her rich endemic species before tourists including mammals, birds and reptiles. This island is the home to the world's first wildlife sanctuary, which was established by Sri Lanka's first Buddhist monarch back in the 3rd century BC. The famous Sinharaja Forest Reserve is one of the island's primary tropical rainforests and is considered a UNESCO World Heritage Site, alongside the Central Highlands of Sri Lanka. A wildlife safari in one of the 14 national parks ornamenting Sri Lanka's map shall facilitate you with the opportunity to spot several animal and avian species, some of which are unique to the island. However enticing these may sound, wildlife tours are not pocket-friendly anywhere in the world. So, a backpacker on a stiffer budget might chose cheaper alternatives like trekking in the cloud forests of Horton plains, hiking in the Knuckles mountain range etc. #7: Sri Lankans don't pet the narrow mentality of squeezing out everything possible from an outsider which backpackers frequently encounter in many developing countries. Although you may have to bargain cautiously with tuktuk drivers or souvenir shopkeepers those are pretty harmless and fun when compared to what you have had faced while backpacking in other Asian countries like Vietnam. As I mentioned before, Sri Lankan locals cordially respond to travellers' needs, unless you're disrespectful to them. There is very little that you can't do, or can't find in Sri Lanka. Now don't return from Sri Lanka yelling back at me as you couldn't find your favourite Amul dairy products in the entire island. Taking a bus is your best bet to travel from one city to another. Most of the intercity buses are non-luxury type and, unless you board them at their starting point expect them to be crowded. Silver lining is the cheap bus fare. Although the island has her railway network I didn't find it so dependable. Many short distance trains are rickety and tortoise slow. Faster intercity express trains are very few. As a foreigner the only way you can reserve your train ticket is by arriving in a railway station, which leaves you with the uncertainty of ticket availability. Nevertheless, Sri Lankan rail routes traverses some picture-perfect landscapes, particularly when entering the hill country. Photo enthusiasts would be delighted by the serpentine train tracks meandering through greenish blue tea enveloped mountains. In a followup post I'll try to blog on my train journey to Anuradhapura, and amateurish attempt to absorb the essence of Buddhism at Ruwanwelisaya. Do check back good folks. If you have any particular query regarding backpacking in Sri Lanka you may ping me anytime. I'll see you soon. I had planned for Sri Lanka to be my next travel destination. Thank you for reaffirming my resolve. Sri Lanka is such a beautiful location! I so want to visit Fort Galle, hope to visit it this year. Great post, thank you for all the details.